All good things must come to an end, as they say, including the boating season on Notre Dame Bay. It is not unheard of for us to experience a snowstorm near the end of October, but generally, we don't have to worry about winter conditions too much until December. 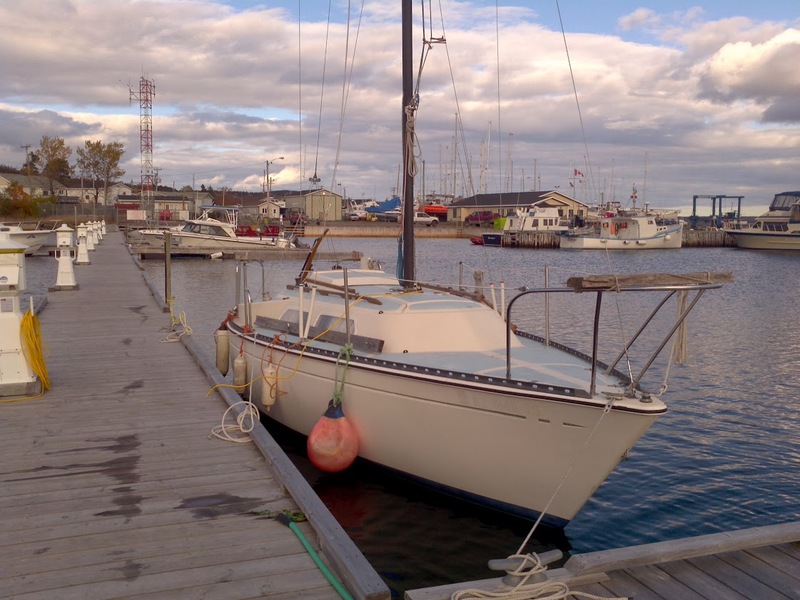 Some people prefer to get an early start on winterizing their boat, and have them high and dry before the end of September. I like to squeeze a bit more out of the season, and wait until the middle of October. This year, however, I intended to be one of the early birds so that I could get a jump on some projects to get me in the water earlier in the spring. That didn't happen. The full moon in September shines down on Serenity. Things can get busy at work in the autumn. The boat trailer had to be prepared. A crew needed to be arranged, and the tide had to be right. Launching the boat from the trailer is a challenge, but we have that pretty much figured out. 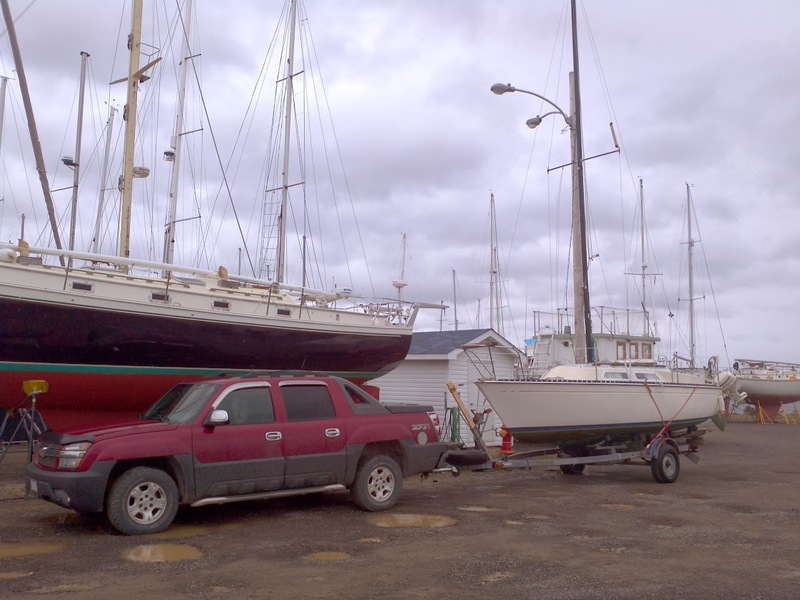 Getting the boat back on the trailer is always an exercise in frustration that sometimes takes days. Every year I try something different to see if that will be the fix. One of the problems is the location of the winch. Instead of pulling the boat forward, it pulls the bow down. This keeps the keel from slipping into the guide, and also does not pull the boat all the way up. There is always a gap between the bow and the v-stop. The plan this time was to attach a 2x4 with a block on top to the trailer to raise the angle. 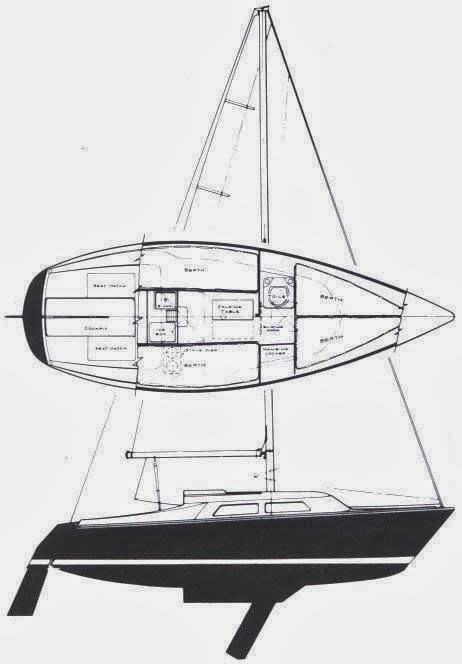 I could also operate it from the cockpit, keeping my weight off the bow. 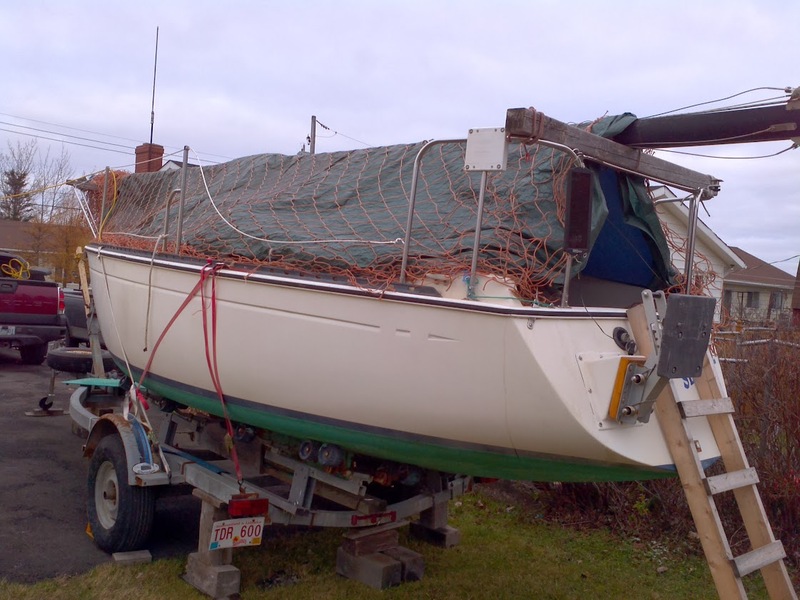 Measurements were taken in the spring while the boat was still on the trailer, but the thing was not put together until it was time to haul out. Boat hauler experiment. You can see how far the bow is from the stop. I'm not sure if this setup helped or not, since there was still trouble getting the boat on the trailer, and it was still resting too far back on the trailer once the weight was on. The winch was attached too, and it must have been too tight, again pulling the bow down. This setup will be modified by sistering the other 4' section of the 2x4, with it 6" higher. An eye bolt will secure the block's snap shackle to the new board. The rope could be taken around a cockpit winch too, if required. October 26. Preparing the boat to come out. My dock was removed for dredging. 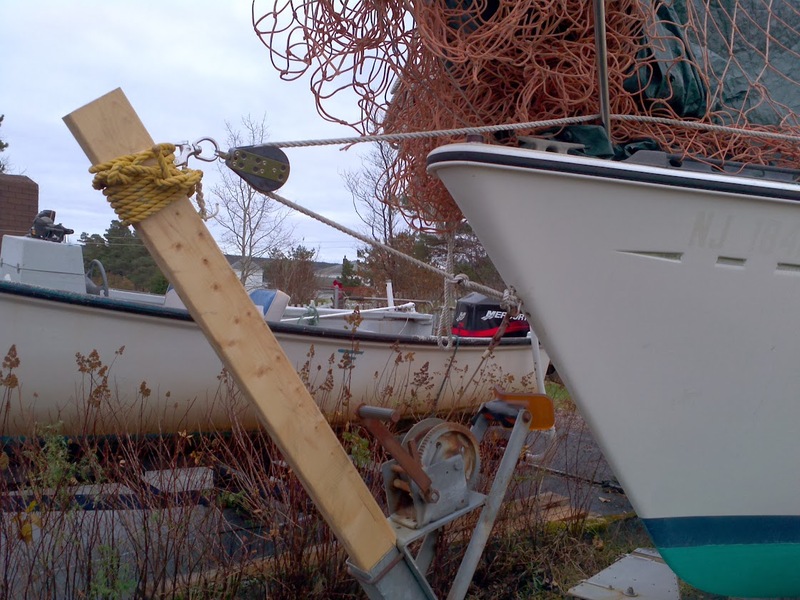 Anyway, on October 27, a month late and after much fooling around with the help of everyone nearby at the marina, we did get the boat out of the water and up into the parking lot where it could be pressure washed, and the mast dropped. Serenity looks tiny compared to most of the other boats. Getting the boat home involves about a 10 minute drive, but doing the final winterizing took a few more days, with weather and other distractions, like work. 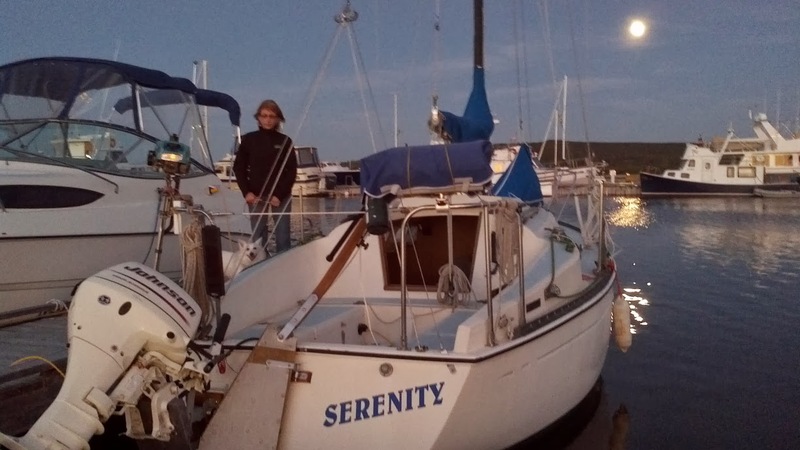 It was not until November 10 that I could declare Serenity ready for winter. Tarped over and netted, fluids drained, trailer blocked. Now a list of projects for 2014 can be written up, and plans made for future trips. It is also a time to watch sailing videos on YouTube, and browse the online marine stores for gadgets the boat absolutely must have.